Nasal and throat obstructions are the major causes of coughs and breathing difficulties, due to the accumulated phlegm in the lungs. 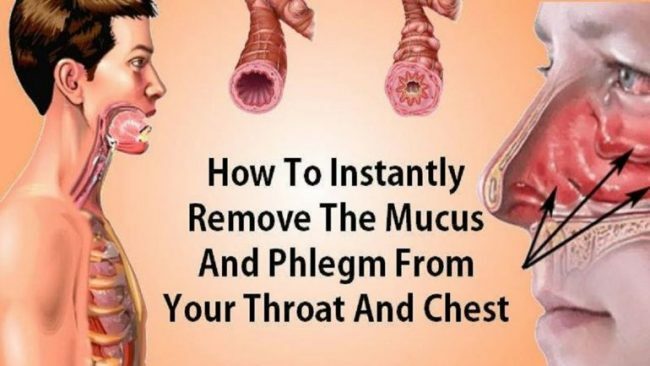 Phlegm is the sticky substance secreted by the respiratory system as a way to protect itself, and its role is to trap all dust, allergens, and viruses. However, its excessive buildup leads to coughing, colds, bacterial infections, etc. It is accompanied by a weakened body, a runny nose, breathing difficulties, a fever, and coughs. If not eliminated on time, the accumulated phlegm can cause an obstruction in the bronchial tubes, leading to additional health problems. The active ingredient of turmeric, curcumin, provides strong antiseptic and antibacterial properties, which eliminate bacteria that cause mucus and reduces phlegm while boosting the immune system. Ad a teaspoon of turmeric to a glass of warm water, add half a teaspoon of salt and stir. Gargle the mixture three times daily for a few minutes, to treat respiratory infections and eliminate phlegm in the chest. The combination of lemon and honey treats respiratory issues and offers potent antibacterial and antifungal properties. It boosts the immune system and prevents congestion. In a bowl, mix a tablespoon of organic honey and 2 tablespoons of lemon juice, and consume it three times daily to fight congestion and eliminate excess phlegm. To soothe a sore throat, clear phlegm, and destroy germs, gargle warm salt water twice daily. In a cup of filtered water, add 1/2 to 3/4 teaspoon of salt, and stir well to dissolve it. Sip a bit of the mixture and tilt the head back slightly. You should let the solution wash into your throat without drinking it. Then, gently blow air up from the lungs to gargle for about a minute, and then spit out the water. Cover the head with a towel, and start inhaling the steam. Repeat a few times daily. You should also take a hot bath twice daily to break down the mucus easily. To boost the effects, add a few drops of some essential oil, like tea tree oil, since they offer powerful antimicrobial effects. “Try consuming foods and drinks that contain lemon, ginger, and garlic. There’s some anecdotal evidence that these may help treat colds, coughs, and excess mucus. Spicy foods that contain capsaicin, such as cayenne or chili peppers, may also help temporarily clear sinuses and get mucus moving.